Girl Scouts Love Earning Awards . . . Girls Scouts have Badges, Journeys and Fun Patches. The Badges and Journeys are ‘official’ awards and worn on our Vests or Sashes and the Fun Patches are put on the ‘His Girl Scouts Rock’ Canvas Book Bags. There are also special awards such as the Bronze, Silver, and Gold Awards, The God & Family and God & Church Awards, and several others. We will facilitate your daughters earning as many awards as they choose! 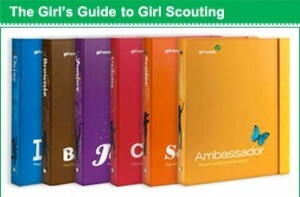 The Girl Scout Year beginning September 2011 is making changes to its awards program at all levels. The goal is to call all earned awards badges (as opposed to ‘Try-Its’ and IPs, for Brownies and Cadettes, respectively). This is a transition year, so we will be working on badges from the previous ‘badge’ books as well as new awards and Journeys. The goal for our Troop will be to facilitate activities the girls select and make them interesting for all grade levels/groups: Brownies, Juniors, and Cadettes. We promise your daughter will have an amazing year . . . we are the most active Troop in Broward County. What does this mean? It means your daughter will experience new things. This will allow her to become interested in new things and perhaps discover something she loves that she never knew about. Seeing our girls explore is one of the most enjoyable things we can experience as parents. We would love to have you join us in facilitating activities . . . so please tell us where your interests are and what special skills you have . . . or perhaps even if you have a connection that can empower our girls in their learning experience. Part of our Mission in His Girl Scouts Rock is to assist the girls in doing Outreach Projects in our community that are age appropriate. Having a servant’s heart is an important part of Leadership. The insignia on a girl’s uniform are a record of her adventures and accomplishments as a Girl Scout. Insignia is the general term for all official items that girls and adults can wear on their uniforms. Emblems: Girl Scouts of the USA, council, troop membership, and identification insignia. Includes such items as Girl Scout Membership pins, the council identification strip, and troop numerals. Earned Level Awards: Earned by completing requirements or demonstrating understanding of a concept, as outlined in Girl Scout program books, including bridging awards, journey award, and Daisy through Ambassador level awards. Additional Awards: Earned through requirements determined by GSUSA or by other organizations. Includes Girl Scout lifesaving and religious awards and the President’s Award for Community Service. Participation Patches and Pins: Supplementary insignia developed at the national or council level with a focus on participation. Some come with companion activity booklets. Includes American Flag Patch, fun patches, and the World Thinking Day Patch. Girl Scouts can earn or wear different insignia depending on their grade-level. Browse a list of insignia by category or by level. Requirements for several awards and patches are found online, including those that do not appear in printed program publications, insignia that get updated regularly, and special featured insignia. The Girl Scout Gold Award, Girl Scout Silver Award, and Girl Scout Bronze Award represent the highest achievements in Girl Scouts. Learn how Cadettes can assist Brownies along their special quest! Earn your LiA (Leader in Action) Award for the Brownie Quest.